Have a look at our Self Catering and Bed and Breakfast Garden Route Accommodation. See our Rates and Availability for Wilderness Accommodation. Your hosts Tony and Vanessa welcome you to Hildesheim. The Garden Route is a wonderland and is ready for you to discover its rare treasures. Plan a trip along this section of Africa's most scenic coastline and explore a world of adventure and beauty. Take a walk in the wooded riverine sections of the Wilderness National Park or eat fresh oysters from the deck of a cruiser on the Knysna Lagoon. Play a round of golf on one of the many incredible courses in the region or spot whales and dolphins from many vantage points along the coast line. Sound enticing? Hildesheim is ideally located as a base to explore the Garden Route. 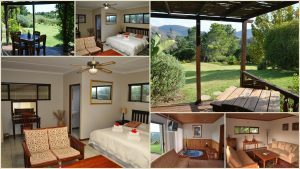 Hildesheim Guest House near Wilderness in the Garden Route offers bed and breakfast and self catering accommodation – Home from Home Hospitality.